I'm Tom, a thirty something father to three beautiful children and husband to my soulmate Karen. I started this blog as a means to talk about stuff, get things out in the open, a bit like an online therapy I guess and to celebrate the progress of my beautiful daughter Rosie who was born in March 2011 with Down's Syndrome (DS) and a Complete Atrioventricular Septal Defect (AVSD). Maybe the experiences shared on here will help others too, hopefully help illustrate the bright futures our children with DS will have if we can break down common misconceptions. When I first found out Rosie would be born with DS I found reading literature with open and honest feelings on the subject, extremely helpful. This is not intended to be a written masterpiece and I can promise you it won’t be. I don’t pretend to have a large vocabulary and to be honest the further behind me my school days become the more my grammar has deteriorated!... however, you will find what is written on these pages comes from the heart. Hi! I have read this with great admiration and I think you'll be an inspiration to many others with similar experiences or even not (similar)! I have often thought about what you might have gone through and i would like to thank you for sharing this. I think Rosie will teach you many things and I envy you a little bit for that! Hi Eirini, thanks for your feedback - it means a lot and I'm really pleased you've enjoyed reading it to date! Hi Tom, I was introduced to your blog via my husband (Mark Iddon) and felt I had to comment on it. It is an inspirational blog and one that had me smiling, laughing and tearful in equal measure. Since finding out that Alexander had DS I have been wondering how Mark and I would have coped had he not been stillborn; I hope we would be as positive and strong as you and your family. Karen and you have three very beautiful children. Hi Jennifer. Thank you so much for your lovely comment, as I said to Mark I just can't imagine your pain, you have been through so much. It means a great deal to me that you enjoyed reading the blog. Keep strong and Love to your family. My first job was as a support worker at a college for young adults with learning difficulties. Many of our students had Down's Syndrome. I'm glad that you started this blog - it really challenges the hurtful 'disability as tragedy' myth, which in my experience is far more damaging and life-inhibiting than any disability. (This is true from what I saw of my students, and what I've experienced myself as a disabled woman.) I'm so happy to have found your blog and I'll be checking back regularly. Thanks Vicky I'm really pleased that you enjoy the blog and your feedback means a lot to me, thank you very much. I was given 2 invaluable pieces of advice when my daughter arrived. 1. Recognise the emotional timeline has extreme ups and downs. 2. Never plan your life/or see your life more than 3 months ahead. Excellent advice indeed. Thank you Jonathan. After seeing your article on the BBC, i just thought how great it was that you are making a difference. There is a massive lack of REAL information on downs, especially the joys to life they bring. I had a downs brother, who sadly, prematurely passed on when i was 8 years old. I will always treasure those memories. People with downs always seem to see the best in people and find happiness. I am sure Rosie is the same. Hi Gary, thanks for your message. I'm sorry to hear you lost your brother prematurely I can't begin to imagine how difficult that must be. Your offer of support in fundraising is very much appreciated. Thank you. My nephew Reuben was born yesterday and was quickly diagnosed with DS. My brother and his partner are experiencing all kinds of emotions at the moment and as a big sister I have been trying to find out how I can help. They live a 4 hour drive away from all close family and its safe to say we all feel a bit useless at the moment. I just wanted to say that I have read various entries on your blog and they have all made me smile. Once everything has sunk in (and if he doesn't find it himself) I will be recommending reading your blog to my brother. Your words and experiences will undoubtedly give him strength and hope for the wonderful life we will all experience with our gorgeous Reuben. Thank you for sharing. Thank you so much for contacting me. Firstly let me congratulate you and your family on the safe arrival of your nephew Reuben. Although my wife and I had a pre-natal diagnosis I remember only too well the raw emotion – feelings of fear and confusion. I've since learned that the majority of my concerns were born out of my own ignorance. There are many myths associated with Down's syndrome that your brother will soon learn are just that...myths. I also have a Facebook page which you can message me through should you wish to ask any questions in a less public domain. There is a lot of support out there but the key is not to in-undate yourself with information as it can get overwhelming. When your brother feels ready if he wants he can message me with any concerns, or just to know he's not alone (which he certainly isn't). Best wishes to you all and I'd love to hear back when you feel the time is right to know that you're all getting on okay. Thank you so much. I have already shared your facebook page with my brother and other family members. Thank you for your message on the page which I'm sure will reach out to them. Everyone's comments were so touching. The support from so many strangers is incredible. You have already done more than you could possibly know. I have just started a Down Syndrome Blog. I am looking to include links to other blogs, pages or sites with information or stories/journeys about DS. I have found your blog and am asking if I could use it as a starting point to get a links page up and running on my blog? Please do not feel you must let me use it - I truly understand if you do not. Also, please could you make a little post/link on your site about my blog, just to get it up and running? 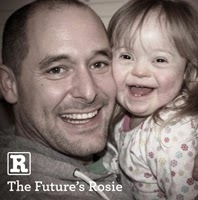 Hi tom, such a lovely blog you have created for you daughter rosie. great work. Found yr blog while googling avsd as my grand daughter to be was diagnosed at her 20 week scan (further tests show she doesn't have ds) seeing yr lovely daughter looking so happy and healthy gave me such hope as Google can be quite scary!! Thank you so much x my granddaughter is due November 2014 . I've only discovered your blog this evening when you won awards at the MAD blog awards. I wish I had found it sooner. Our daughter is now 13months old but at our 20weeks scan a heart defect was picked up. We were also warned our Baby may also have Chromosome 22 deletion (DiGeorge syndrome) and felt the consultant at Liverpool was pushing us towards a termination with a very bleak prognosis. But a visit to GOSH later that week blew massive holes in her Theories and thankfully, 3 open heart ops and a pacemaker later - Martha Grace is now on 6 month check-ups and I am so glad we followed our instinct to give her the best chance in life. I have an 8 month old girl Ariel and she has DS. Blogs like yours definitely help... I am doing my own also as like you I feel it is therapeutic. Rosie is vey very cute!! !